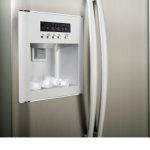 Ice Maker is in a way an independent appliance inside the appliance and most of the time ice maker problems are not directly related to the refrigerator problems. If it has been just installed it will probably take up to 72 hours for the full production of ice. In order for an ice maker to cycle freezer conditions must be normal. If it is below normal it will suspend the ice making process but that does not mean that your ice maker is broken. Also, there should be no crumpled tubing from the water supply. Sometimes your ice maker might produce hollow cubes. Almost in all instances, this would happen due to the insufficient water supply. There is a possibility that the filter is clogged and needs to be changed. In some cases, the signs of improper water overflow will appear in the ice bucket and or immediately around the ice maker, when the ice maker system is showing signs of malfunction. Getting a piece of expert advice as to what the issue that you’re having is, and whether or not it can be repaired swiftly can be easily done by calling a professional. Most issues can be signs of larger problems and can be hard to assess without an experienced technician looking at the issue and seeing whether or not it’s a problem with the ice maker itself, refrigerator, connections, or something else. We are reachable via both email info@appliance-medic.com and telephone: 845-617-1111, so if you’re interested in repairing or even maintaining your ice maker please don’t delay to drop us a line. We have already handled ice maker repair jobs of all of sorts and never use anything at all but the best ice maker repair parts and methods. It’s imperative that you don’t let any problems with your ice maker to go without addressing it to technician. It’s far cheaper to have a professional come in and help you than to wait for something to break apart and cause you to then have a bigger issue. Instead of waiting, simply call a pro and tell them what’s going on- you’ll be surprised how much lower the cost will be than to replace a broken ice maker completely. Off-taste, odor or gray color in the ice. Do not replace your ice maker when you encounter any of the issues mentioned above or when something seems to not be going right. The problem could be an easy fix that requires a few turns of the wrench or it could be a matter of changing a part. Get expert advice first and see if a technician can get to the root cause. Often times homeowners make mistakes when dealing with machines in their home thinking that they will only malfunction when replacements are needed, but that’s definitely not the case with many appliances. Whenever in doubt, call an expert. Professional diagnosis is important when performing ice maker repairs. Appliance Medic makes the effort to keep your appliance working and has the ability to provide our clients with free appraisals with the repair so you can make a well-informed decision on exactly how to repair your ice maker problems. We even offer a 1-year warranty on labor as well as ice maker repair parts that were installed. If a not working or inoperative ice maker has been literally making your life a lot more challenging, please do not delay to seek solutions from our specialists. We bring our passion with regard to our work and respect for our clients to each and every job.